Do you ever feel like you need a little creative push? Are you looking for some inspiration to think (or, BEAD) outside of your comfort zone? Want to bead outside your box and possibly win a prize at the same time? Well, you’ve come to the right place! Welcome to the Eureka Crystal Beads APRIL BREADING CHALLENGE! Crystal Cup Chain consists of individual crystal stones in settings (in this case, prong settings) and connected by a flexible metal base. There is absolutely no purchase required for entry to the prize giveaway, or the April challenge, but we do sell a variety of cup chain on our website in case you’re wondering where to find it. Below is a helpful compilation of some information about cup chain, and some links to blog posts and tutorials outlining ways to work with it! The line of crystal cup chain that we carry is made by Preciosa and comes in sizes 2mm, 3mm, and 4mm. Metal settings come in choices of (from Left to Right) Gun metal, Silver, Rhodium, Brass, and Gold – so many options! Come take a peek at all of Eureka’s Preciosa Crystal Cup Chain and cup chain findings! We hope you challenge yourself to use some Cup Chain to come up with something spectacular to submit for the April Challenge! HOW does this all work? Every month there will be a theme to follow. Examples of themes could be to feature a color or color palette, to show off a specific product, to work within a technique, or take inspiration from a fashion movement or decade! We welcome beader’s to submit creations of their own design, or ones that followed a pattern or video tutorial. Just make sure that you credit the designer (if the designer isn’t you). Themes will be announced at the beginning of each month. APRIL 2019 THEME: CRYSTAL CUP CHAIN! What is the DEADLINE for submissions? The deadline for submissions each month is the last calendar day – easy peasy! How do I SUBMIT my entry? First, you’ll need to be a member of our online Facebook group: The Beader’s Nook at Eureka Crystal Beads. JOIN HERE, it’s free and fun! At any time during the month you can post your submission in the group to show it off and say a little something about it! ***NOTE: You’ll have to use the hashtag “#Nook419” (which should turn into a blue link after you type it) in your post so we can collect all the submissions at the end of the month. (In case you’re wondering: “419” = April 2019. So next month, the hashtag to use will use 519, for May 2019) >>> Learn more about The Beader’s Nook HERE! Can I submit MORE THAN ONE entry? Absolutely! Who are we to stifle your creativity!! BUT, it should be noted that additional entries will not gain you advantage in winning the random month-end prize. Is it alright to use Cup chain in my stock or do I need to purchase yours! This is a fun and Awesome Giveaway!! There’s so many different options of what u can make. So many pretty colors!! Sounds fun. Can’t wait to get started! I think the April challenge is fun. It certainly has me challenged since I’ve never used the cup chain before in any of my projects. I have some ideas that hopefully works out. I think that this is a great challenge! I am just now entering the world of making jewelry and I primarily work with seed beads. It would be cool to find out how to use cup chains! I am always looking for new ideas for cupchain and this will get my mojo going. Thanks Leah! Wow, So many colors in cup chain. I haven’t tried cup chain yet. I’d like to do that soon. Can’t wait to see what people come up with! This is a great challenge. I can’t wait to see the entries. I have used cup chain before in bracelets that I made a few years ago, I love the crystal ab. I love this site and all the goodies you have. Things are priced right and everyone is great to deal with. Thank you!!! I have one that I did somewhat recently, can that count, or do I need to create something new? I’m so allergic to any metals but gold so although I’d love to give this a go- it would require some way of burying the metal….which is yet a bit beyond my skill set, sadly. 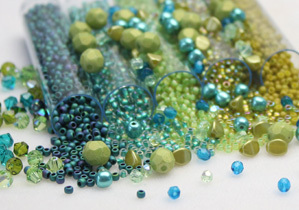 What is the most commonly used size of cupchain used for bead embroidery? I bought some that is not metal mounted and not sure the size. I am going to have to try something. Sounds like fun! Love your contests , your tutorials and your merchandise ! winning is one of my favorite things!!! I wish I could afford to make all the beautiful things I see. I really enjoy reading your blog posts, learning new things and getting new ideas. I was going to ask the same thing as Susan Picken above. Question answered. I do have a stash of cupchain but still working on bead embroidery. I always have something to do. Never bored! I recently completed a kit from another shop that uses cup chain, Is it okay to enter giving credit for the kit? I love to be challenged with new products and techniques pertaining to beading! I have never used cup chain. I guess I better get started learning. Fun challenge to try to use cupchain.